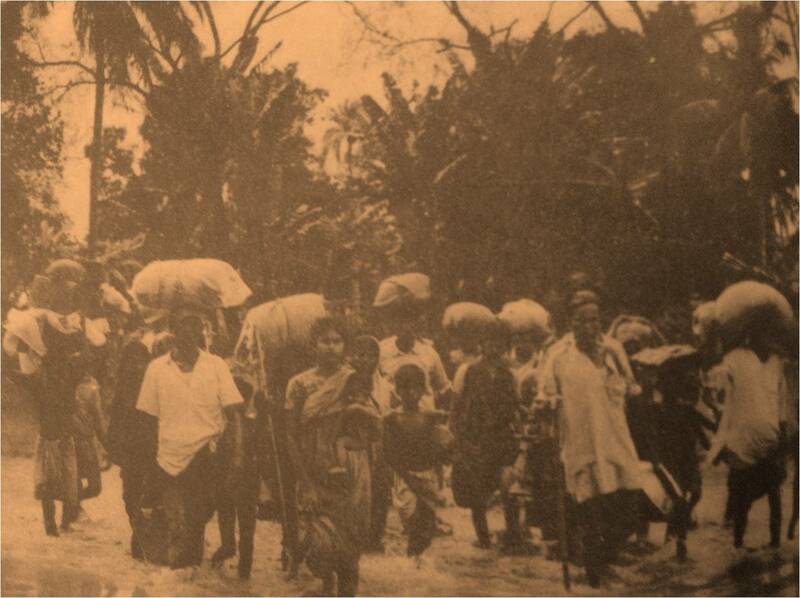 In 1971, an estimated 10 million refugees crossed the border from East Pakistan into India (UNHCR 2000 59). The sheer magnitude of this movement of people – the largest single displacement of refugees in the second half of the 20th century (59) – is staggering. Writing from the town of Barasat, a city located in the outskirts of Calcutta, West Bengal, Sydney Schanberg, a journalist with the New York Times, describes the town as a “swarm” with refugees “so thick in the streets that cars can only inch through” (Schanberg 17 June 1971). The refugees seemed to be everywhere – sitting in the streets, crouching in doorsteps, sleeping on porches, occupying empty buildings, and cooking in the fields (Schanberg 17 June 1971). They attempted to build lean-tos only to have the monsoon rains rip them apart (Schanberg 17 June 1971). The refugees, Schanberg writes, appeared “anxious and troubled … look[ing] for someone to answer their questions … ‘Do they know we are coming?’” (Schanberg 17 June 1971). After having “trodden long distances on foot in grim agony and in a desperate effort to escape from the ruthless atrocities of the Pakistan Army” (Luthra 1971 2467), to ask such a question seems out of place, even unnecessary. With its odd mix of apology, affirmation, and imposition, it is the question of a guest who is extended a welcome by the host and yet seems unsure as to the nature and extent of that welcome. Such an interaction reflects what Ranabir Samaddar describes as “the double imperative of how the State governs – a contradictory logic of power and care, and a paradoxical injunction built on the heritage of rule” (Samaddar 2010 113). Like other mass influxes of populations that sought refuge in India – the Tibetan refugees who arrived in the 1950s and the Chakma refugees who arrived in 1964 (Chimni 1994 378) – the 1971 refugees were indeed welcomed. However, unlike the two previous mass influxes of refugees, the 1971 refugees were extended a limited welcome and were accorded hospitality “only until such time as they were able to go back to their country of permanent residence with dignity” (Mukherji(2) 1974 399). The policy for the 1971 refugees, as articulated by the Indian state, makes no mention of rehabilitation, integration, and absorption (399). Their existence in India was to be temporary and their status was to remain as foreign nationals (399). Their existence would ultimately prove to be temporary when, on December 15, the Pakistan army with 93,000 soldiers surrendered in Dacca (Jahan 1995 202). Following decisive military action led by the Indian army, the independent nation-state of Bangladesh was born (202). Just as the 1971 refugees made history with their arrival, so too did they set a record with their departure. Beginning in December of that year, millions of the refugees returned to a new homeland in what would be and remains the largest repatriation operation of the post-Second World War era (UNHCR 2010 59). The story of the 1971 refugees – their exodus, reception, and eventual return – forms part of a wider narrative that brings to life the disintegration of one nation – Pakistan – and the birth of another – Bangladesh; the revival of historic grudges between two bitter neighbours – India and Pakistan; the international indifference manifested against a backdrop of Cold War politicking; and the miserable conditions that greeted the 10 million souls who sought refuge in India. The story that serves as the basis of this paper is that of the Indian state, namely the way in which its articulated policies on the 1971 refugees shaped, on the one hand, the state’s understanding of refugeehood and its response towards refugees, and, on the other hand, the refugees’ own understanding of this label and the implications the policies had on their sense of belonging and identity formation. Through an analysis of the decisions taken by the Indian state, the labels administered, and the bureaucratic institutions established, this paper explores the tension between the notion of charity and the notion of rights (Samaddar 2010 114) by asking: On what grounds did the Indian state justify repatriation as the only viable solution to the situation of the 1971 refugees? Since the answer to this question goes beyond the constraints of a blog post (and forms the basis of a paper that is forthcoming from CRG Policies and Practices) I outline one conceptual framework – the legal – to think through the state’s response. Repatriation, along with resettlement and local integration, form the ‘three durable solutions’ to refugee problems as recognized by international law and supported by the Office of the United Nations High Commissioner for Refugees (UNHCR) (Bradley 2006 1). To repatriate, in its most basic form, is to send the refugee or asylum seeker from their country of asylum back to their country of origin (1). The key principles underlying repatriation are the right to return (as codified in Article 13(2) of the Universal Declaration of Human Rights) and the right not to be forcibly returned to situations of persecution or serious danger i.e. the right of non-refoulement (as codified in the negative terms of refoulement in the 1951 Convention Relating to the Status of Refugees (“1951 Convention”)). The solution of repatriation is thus premised on the country of asylum’s right to withdraw refugee status so long as it has determined that protection in the country of origin is viable (Hathaway 1997 551). Once withdrawn, the refugee becomes subject to the regular rules of immigration control and may be required to return to their state of origin (551). The challenge of situating the 1971 refugee influx and state response within the legal conceptual framework is that India is not a party to the 1951 Convention and its 1967 Protocol (Chimni 1994 379). Furthermore, India only acceded to the two Covenants on Civil and Political Rights and Economic, Social and Cultural Rights in 1979, several years following the return of the refugees to Bangladesh (379). The value of this conceptual framework therefore does not derive from what it tells us about India not signing these documents but rather the way in which this non-accession defined and configured the state’s responsibility (Samaddar 2010 115). In a meeting with economic editors, Indira Gandhi described the solution to the refugee influx this way: “I am just going to send them back. I am determined to send them back” (Statesman 18 June 1971). This policy of “sending them back” served as a constant reminder that the refugees “belonged to Bangladesh … and were going back as soon as the situation returned to normal” (Rangan 29 December 1971). Had the policy not been this clear and forceful, members of the government feared that they would be giving the wrong impression, namely “that [the refugees] are going to be absorbed in this country” (Statesman 24 May 1971). The policy had two principal implications. First, it was used by the state to justify limiting the refugees’ access to the labour market, relegating the refugees to camps, and discouraging the dispersal of refugees from the Border States to other parts of India (Statesman 21 April 1971). Second, it was employed by the newly created Bangladesh government to encourage and foster feelings of patriotism for the new state. In his tour of the refugee camps, the Bangladesh Minister of Home and Rehabilitation urged the refugees to “not stay here as evacuees but go back and take part in the national reconstruction” (Statesman 31 December 1971). The policy of “sending them back” was realized in a surprisingly successful manner. Funded by the Indian state (Rangan 23 December 1971) and coordinated with international relief agencies and the administration of Bangladesh (Durdins 3 February 1972), over 6.8 million of the 10 million refugees returned within two months of the end of the conflict (Durdins 3 February 1972). Each family was given two weeks’ worth of rations that included rice, wheat-flour, lentils, charcoal, cooking oil, and a small cash allowance (Rangan 2 January 1972). While the Indian state was not constrained by the international legal regime, refugee rights were recognized in practice, albeit in a limited sense. 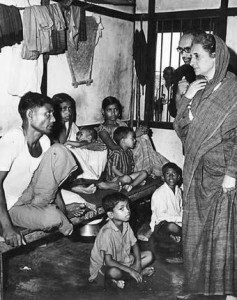 In an August speech, Indira Gandhi commented that repatriation would only occur if the “conditions for their (refugees) safe return were created” (Statesman 31 August 1971) and again in a September speech, where she articulated her vision of returning the refugees “in safety and dignity” (Rahman Volume 12 80). In the absence of any legal regime according to which the state response can be evaluated, phrases such as “safety and dignity” become highly malleable, even strategic tools to be employed by the state according to its own needs and demands. One editorial roots the responsibility of the state in the notion of humanity (Statesman 22 April 1971). However, to what extent does humanity guide state action? The editorial proposes one understanding of the term by focusing on housing, feeding, and clothing the refugees but arguing against the “dispersal to other States or arrangements for permanent rehabilitation” (Statesman 22 April 1971). There emerge two principal limitations with this legal conceptual framework. First, the legal framework is unable to account for the situation of those refugees who feared a return to this so-called “home” (Rangan 23 December 1971). For some refugees, particularly the Hindu minority population, this fear stemmed from the threat of religious persecution whereas for others, a desperate economic situation in Bangladesh seemed discouraging (Toffler 5 August 1971). Pervading both the religious and economic concerns is a questioning of this notion of “home.” Toffler discusses repatriation with a group of refugees who respond to him this way: “‘Why should we go back?’ many replied.’ This is our country.’ To the Pakistani Hindu, India has always been Amar Desh – ‘my homeland’” (Toffler 5 august 1971). The state’s use of repatriation as the only solution is premised on the faulty assumption that “everyone wants to return … home,” a premise that the state did not assess since it appeared, “in the absence of other options, to be largely irrelevant” (Zieck 1997 447). Second, the legal framework is unable to evaluate the nature and extent of the voluntary dimension of the repatriation effort. 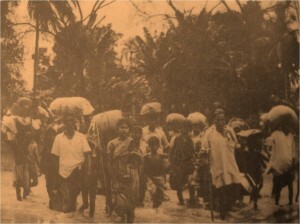 Reports from the press describe the Indian state withholding rations and future transport to encourage the refugees to leave. According to Rangan, “although the refugees were not compelled to return they were not being given much choice either” (Rangan 8 January 1972). Bradley, Megan. “FMO Research Guide: Return of Forced Migrants.” Forced Migration Online. 2006. http://www.forcedmigration.org/research-resources/expert-guides/return-of-forced-migrants/fmo042.pdf. Chimni, B.S. “The Legal Condition of Refugees in India.” Journal of Refugee Studies, 1994. Durdins, Tillman. “Bengalis in Dacca Coping with Problems.” The New York Times, 3 February 1972. Hathaway, James C. “The Meaning of Repatriation.” International Journal of Refugee Law, 1997: 551-558. Jahan, Rounaq. Pakistan: Failure in National Integration. University Press Limited, 1995. Luthra, P. N. “Problem of Refugees from East Bengal.” Economic and Political Weekly, December 11, 1971: 2467-2472. Mukherji, Partha N. “The Great Migration of 1971: II: Reception.” Economic and Political Weekly, March 9, 1974: 399-408. Rahman, Hasan Hafizur, and Government of the People’s Republic of Bangladesh Ministry of Information. History of Bangladesh War of Independence Volume 12. Dhaka: Bangladesh Government Press, 1982. Rangan, Kasturi. “Hindu Refugee Returns, Finds Ruins in East Pakistan.” The New York Times, 29 December 1971. Rangan, Kasturi. “Refugees to be Returned.” The Statesman, 23 December 1971. Rangan, Kasturi. “India Begins Returning Bengal Refugees.” The New York Times, 2 January 1972. Rangan, Kasturi. “Return of Bengali Refugees is Gaining Momentume.” The New York Times, 8 January 1972. Samaddar, Ranabir. “Refugees and Dynamics of Hospitality: The Indian Story.” In Immigration Worldwide Policies, Practices, and Trends, by Uma A Segal, Doreen Elliott and Nazneen S Mayadas. Oxford: Oxford University Press, 2010. Schanberg, Sydney. “South Asia: The Approach of Tragedy.” The New York Times, 17 June 1971. The Statesman. “Evacuees Will Not Be Pushed Back.” The Statesman, 31 August 1971. The Statesman. “Refugee Dispersal in Big Way From Tomorrow.” The Statesman, 31 December 1971. The Statesman. “214,000 Refugees Have Come to W. Bengal So Far.” The Statesman, 21 April 1971. The Statesman. “Mrs. Gandhi Says… I am Determined to Send Them Back.” The Statesman, 18 June 1971. The Statesman. “Evacuees Not To Be Sent To Other States – Khadilkar.” The Statesman , 24 May 1971. The Statesman. “Editorial: Yet Another Exodus.” The Statesman , 22 April 1971. Toffler, Alvin. “The Ravaged People of East Pakistan.” The New York Times, 5 August 1971. UNHCR. “The State of The World’s Refugees 2000: Fifty Years of Humanitarian Action.” Geneva, 2000. Zieck, Marjoleine. UNHCR and Voluntary Repatriation of Refugees: A Legal Analysis. Martinus Nijhoff Publishers, 1997. For a legal analysis of UNHCR and the voluntary repatriation of refugees, consult Zieck (1997). For a critical perspective from the Global South on UNHCR and the voluntary repatriation of refugees, consult Chimni (2004). Article 33: (Prohibition of Expulsion or Return) 1. No Contracting State shall expel or return (“refouler”) a refugee in any manner whatsoever to the frontiers of territories where his life or freedom would be threatened on account of his race, religion, nationality, membership of a particular social group or political opinion. 2. The benefit of the present provision may not, however, be claimed by a refugee whom there are reasonable grounds for regarding as a danger to the security of the country in which he is, or who, having been convicted by a final judgment of a particularly serious crime, constitutes a danger to the community of that country” (UNHCR 1951). Published by Peter Grbac on July 28, 2014 at 2:37 am under Uncategorized.